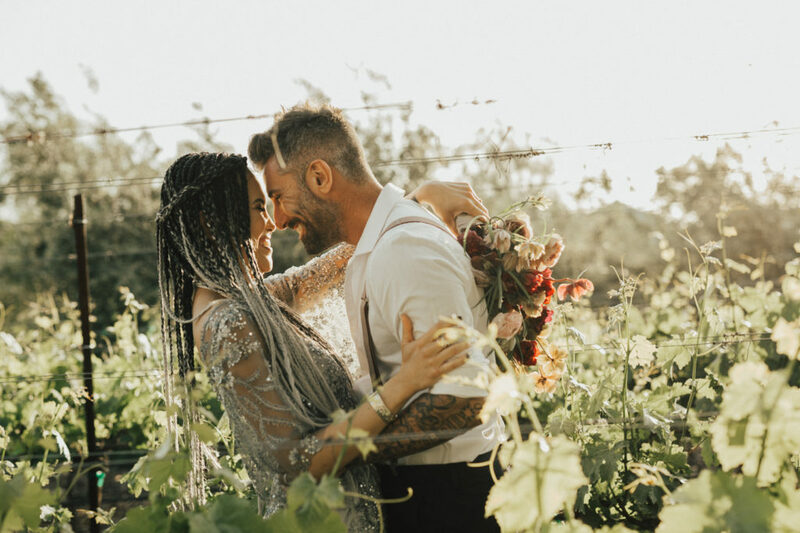 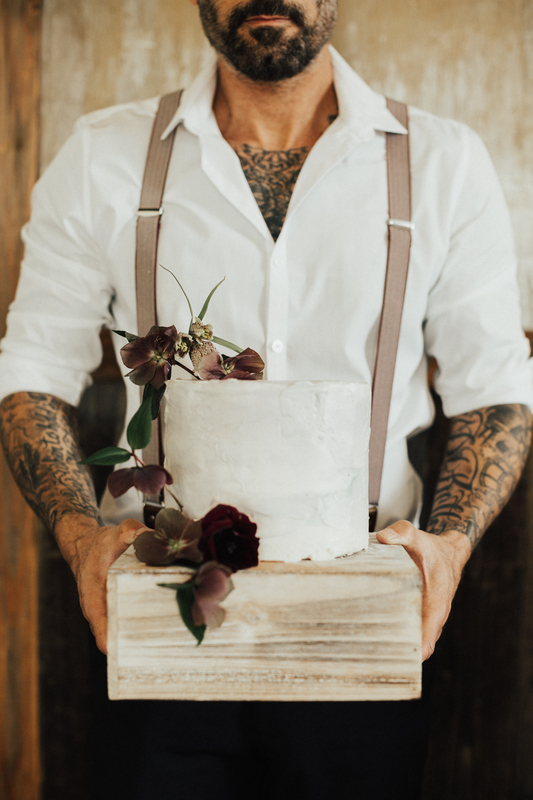 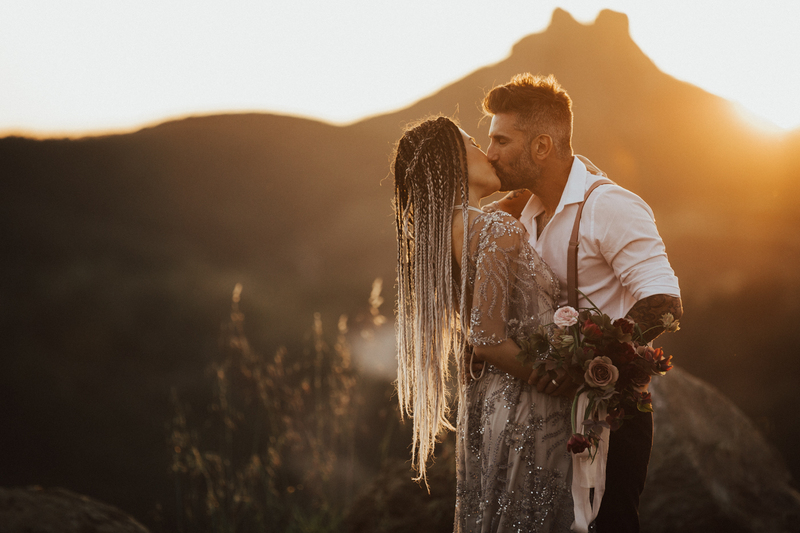 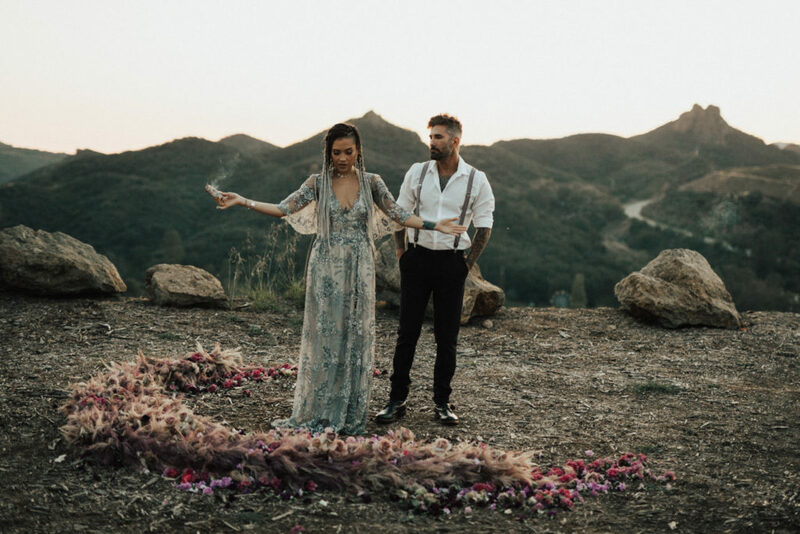 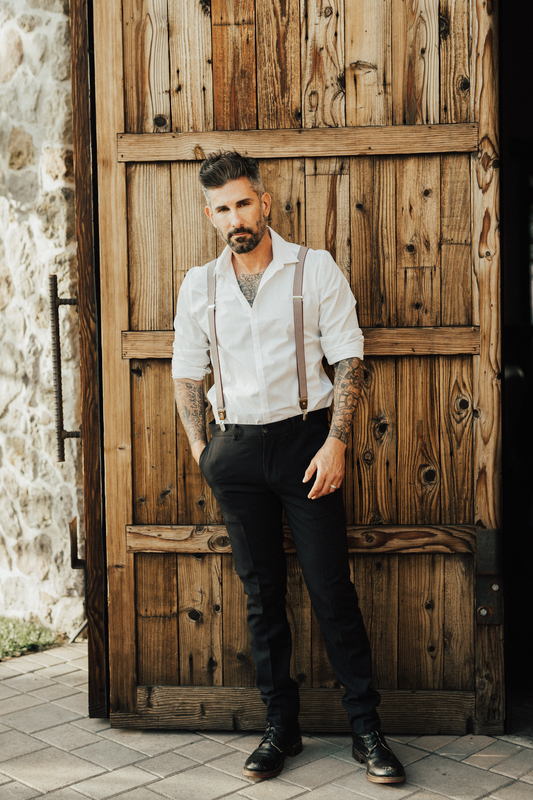 For this Celestial-Inspired Vow Renewal at Cielo Farms, I dreamed up the idea of a metaphysically conscious couple, sharing an intimate anniversary day together, to celebrate their 5 years of marriage. 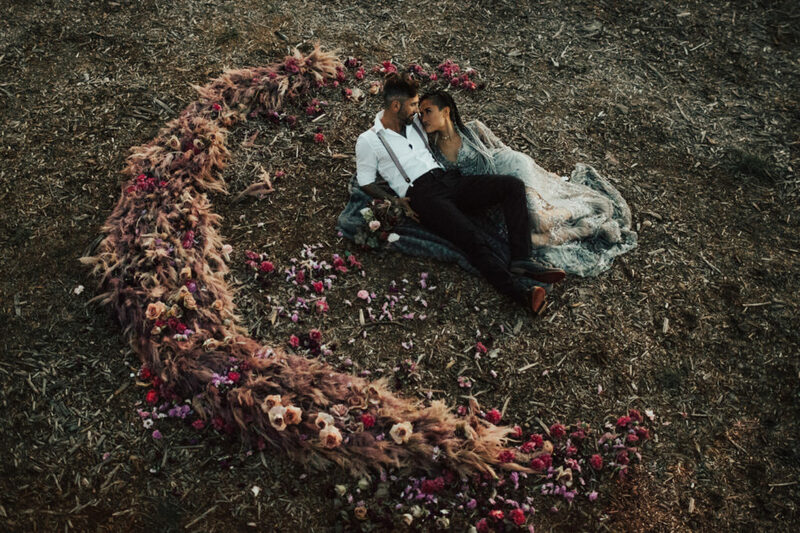 The overall color palette was inspired by both the cosmos and the reflective and optical properties of crystals. 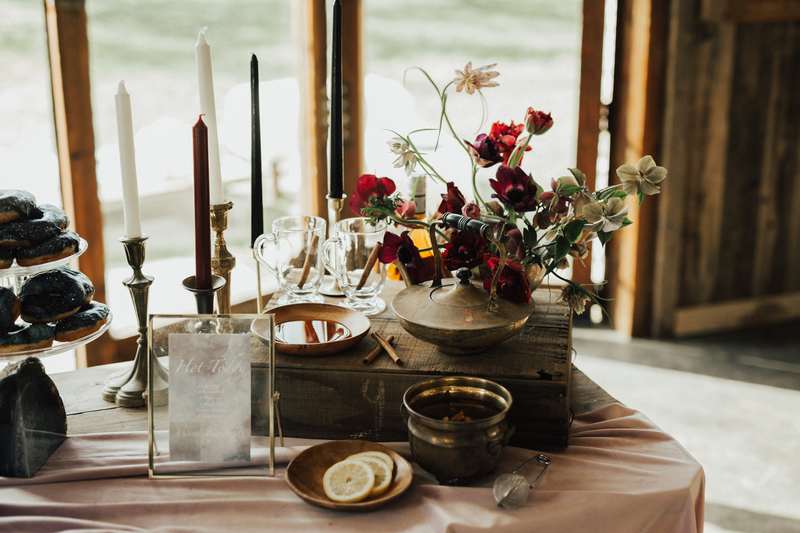 Shades of lilac, soft grey-blues, ivories, and pops of bold purples were infused throughout. Heirlume Photography were the perfect photographers to capture the day, with their love for deep tones, and always authentic style. 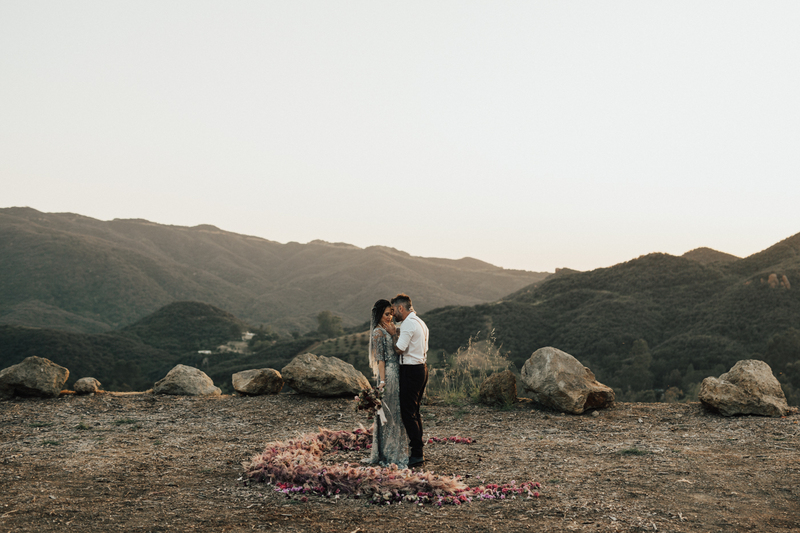 Our real couple models, Mariel and Fred, fit the overall vibe of the shoot perfectly. 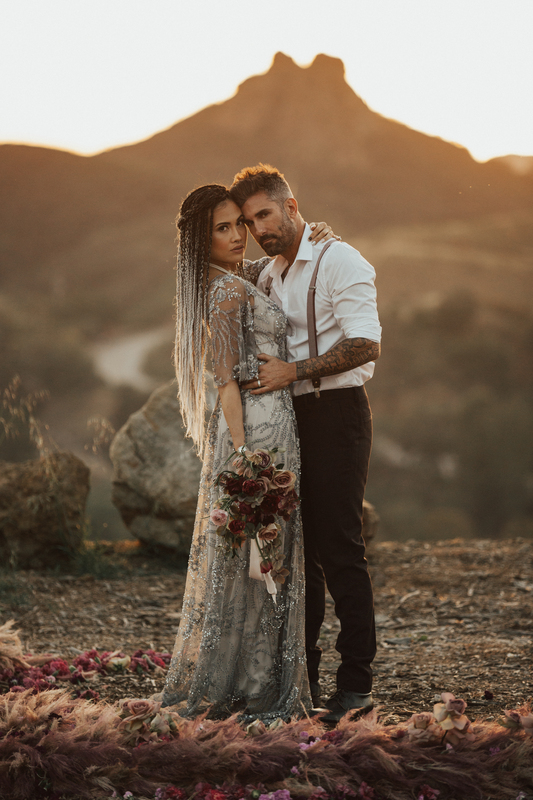 Check out Mariel’s silver tinged braids! 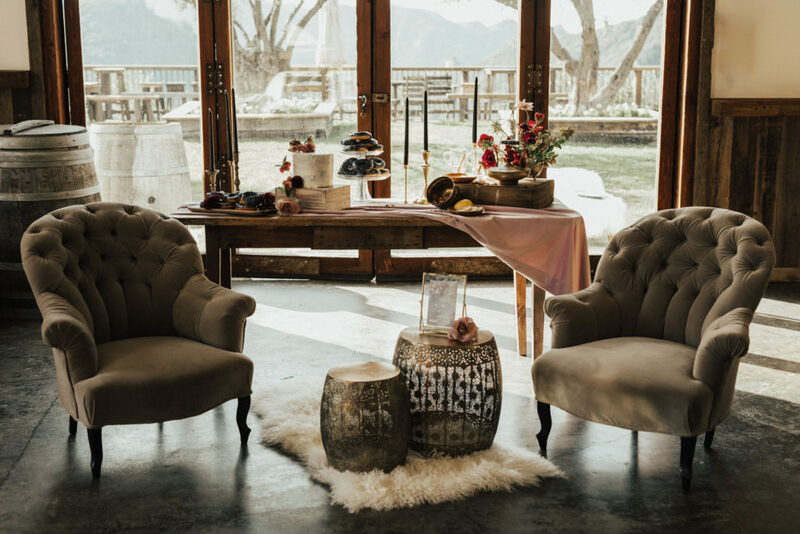 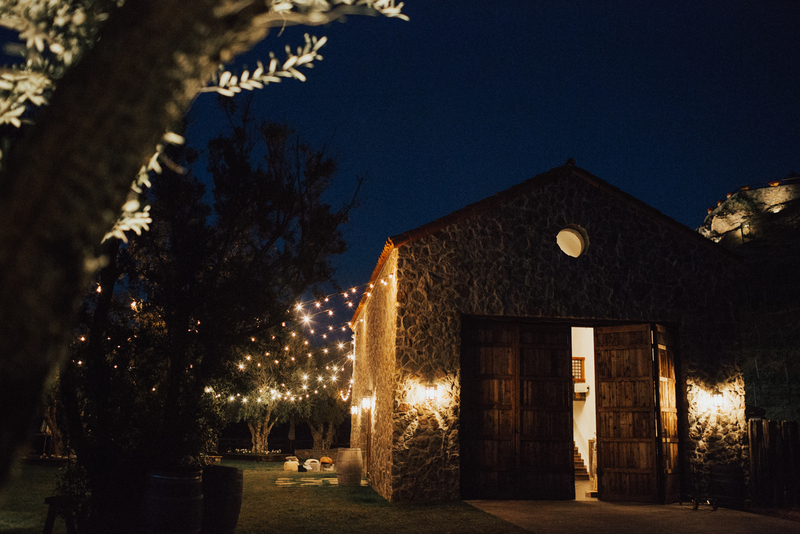 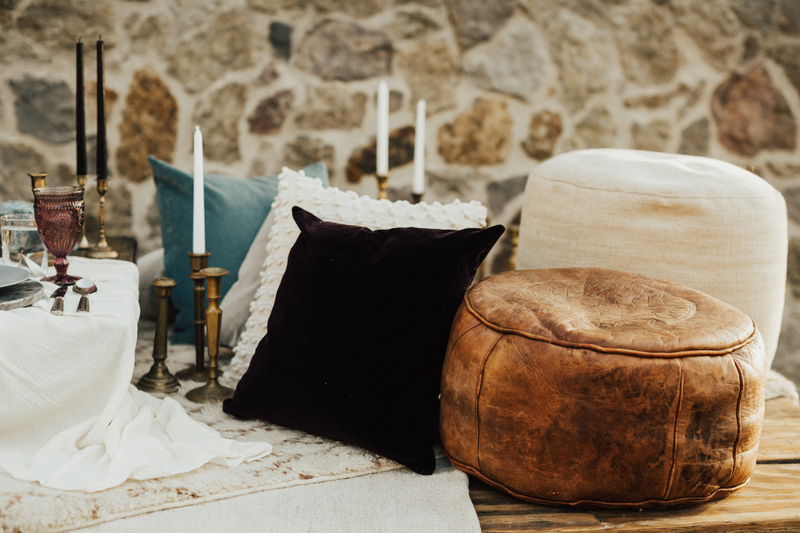 We utilized some less conventional spaces at Cielo Farms, to demonstrate that a couple really can make a space their own, with a bit of creativity. 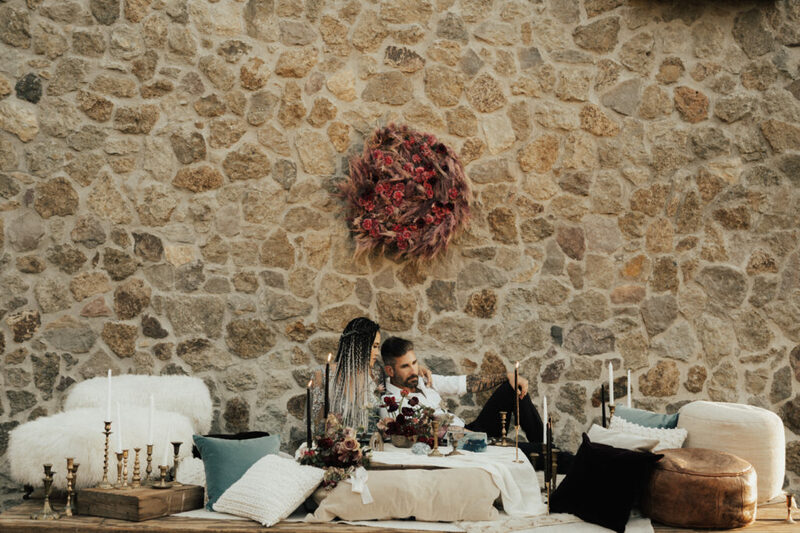 The couple shared an intimate dinner for two, surrounded by candlelight, against the natural stone backdrop. 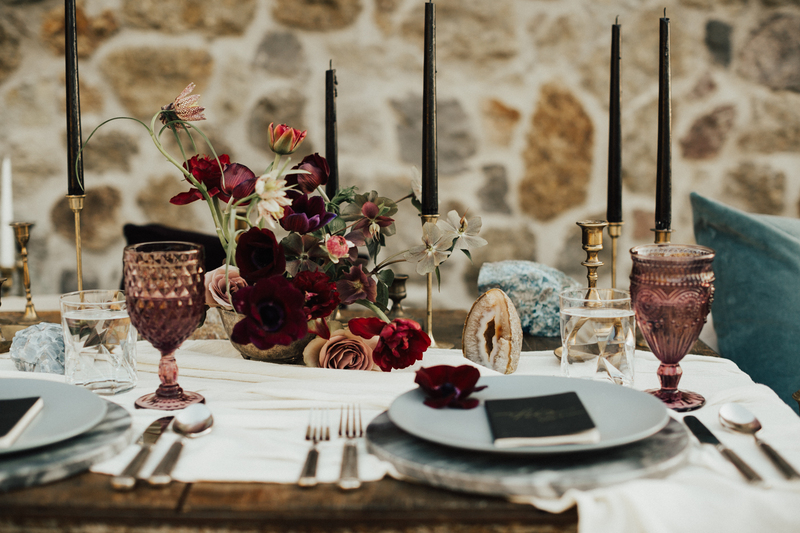 The table setting included marble chargers, grey plates and deep purple goblets from Party Pleasers. 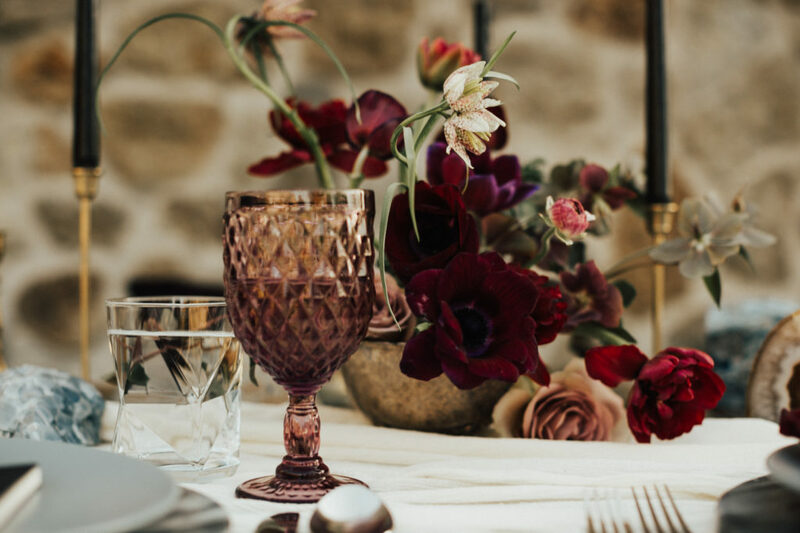 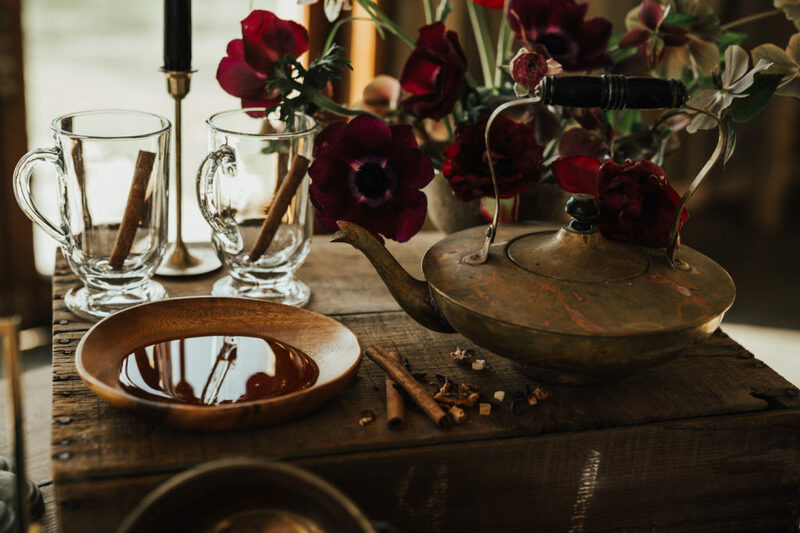 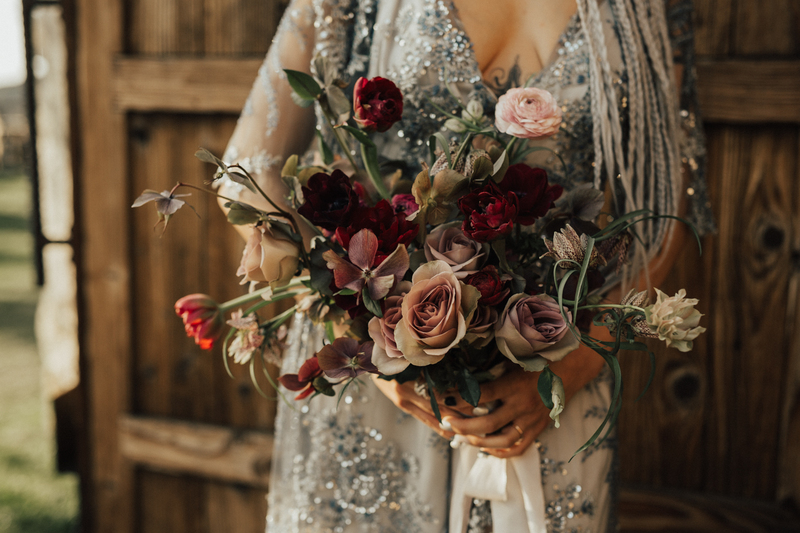 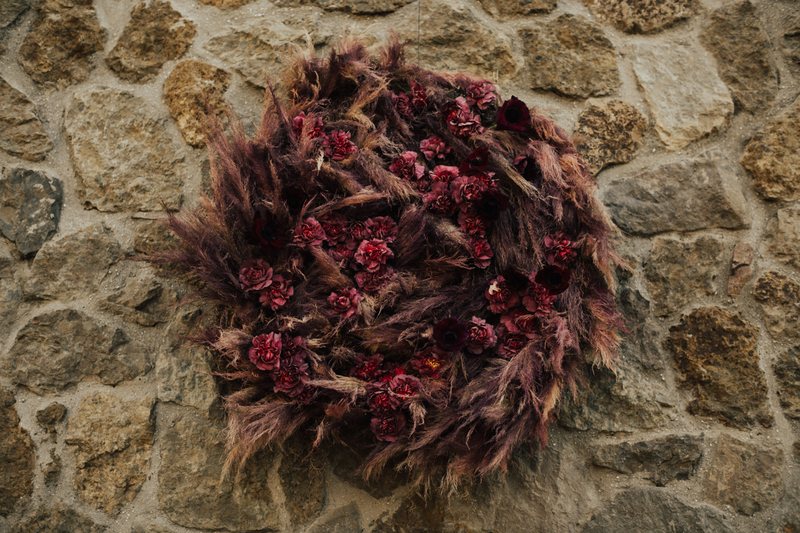 The floral designer, Amy Nicole Floral was excited to contribute to the vision by thoughtfully incorporating moody blooms that lent themselves to the cosmic theme. 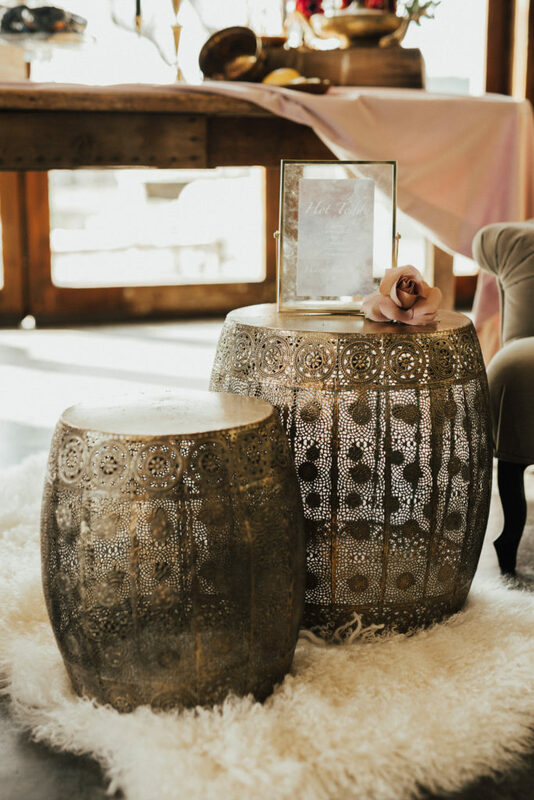 For the dining space, the floral backdrop featured a full moon with “floral craters” to create depth and interest. 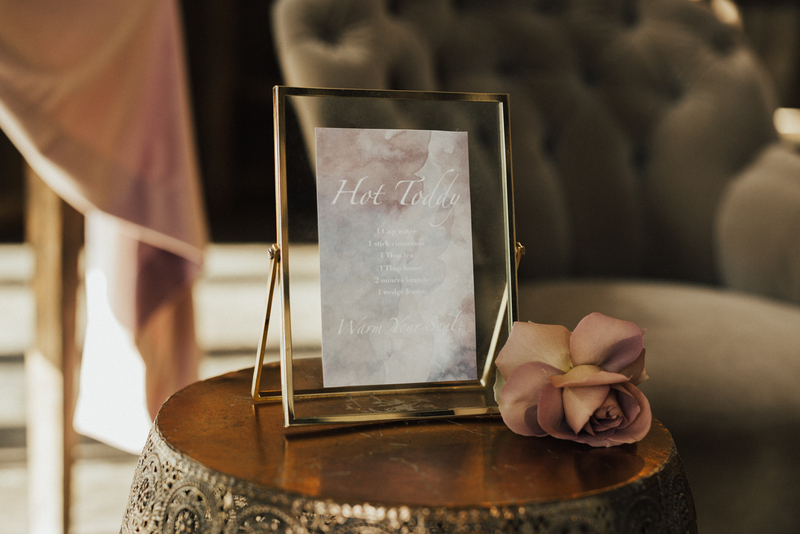 Invitations were designed by Hue Creative. 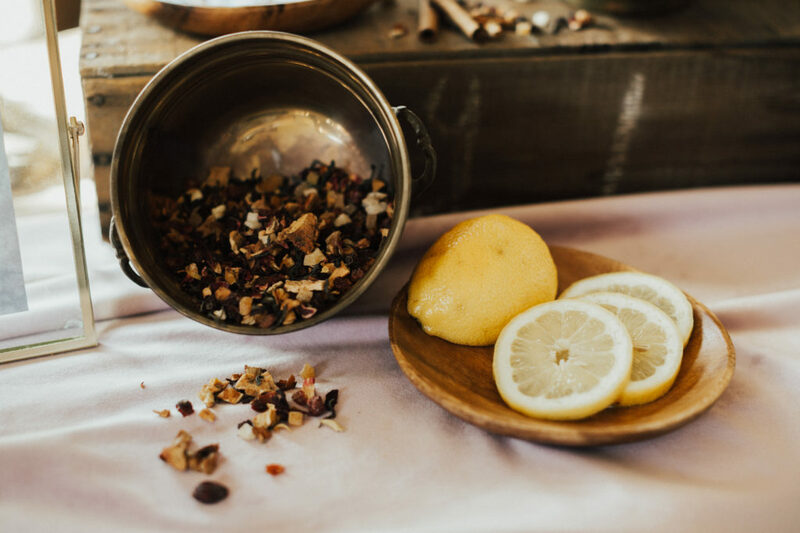 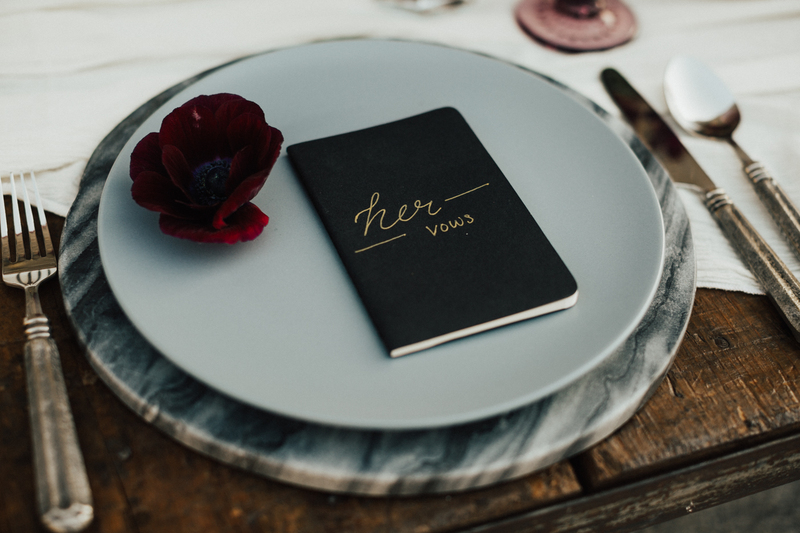 The concept was that the Husband planned a date and vow renewal for their anniversary, and presented the Wife with a letter and invitation to spend the day together. 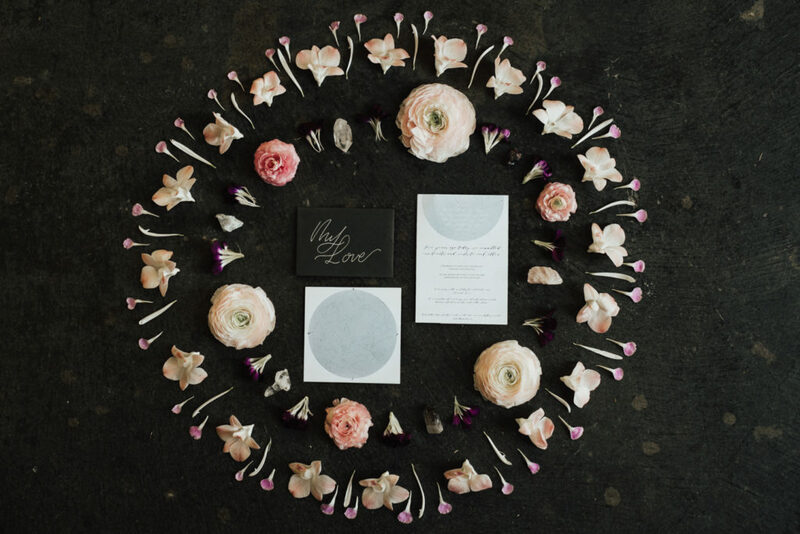 For the shoot, we styled the stationary within a floral and crystal grid, for the purpose of directing positive energy toward their love. 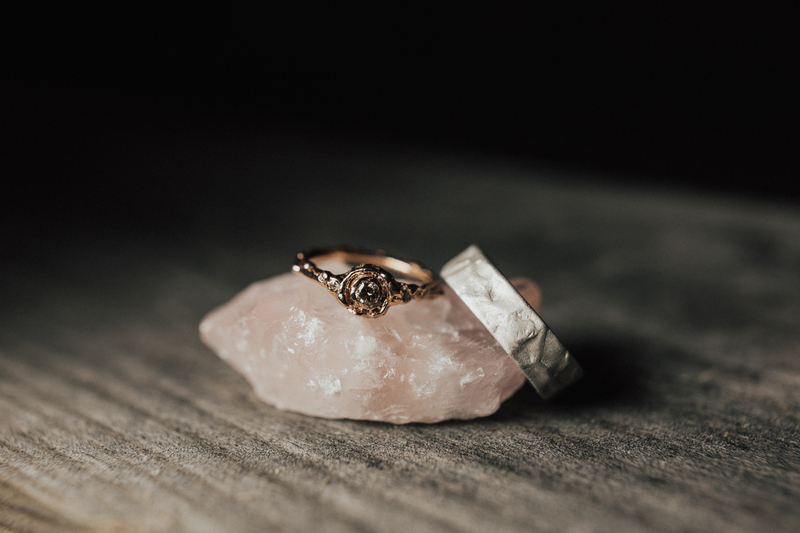 Bjoi Jewelry accessorized our models, with custom made his and hers silver rings, an arm cuff, rose necklace, and a stunning engagement ring, featuring a champagne diamond set within rose gold. 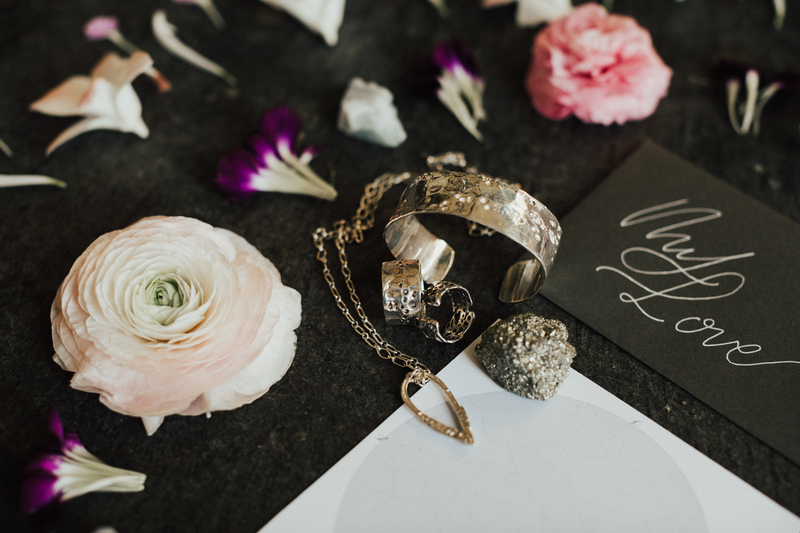 All of their jewelry is cast using recycled brass, silver, and gold, and inspired by Earth and the natural world. 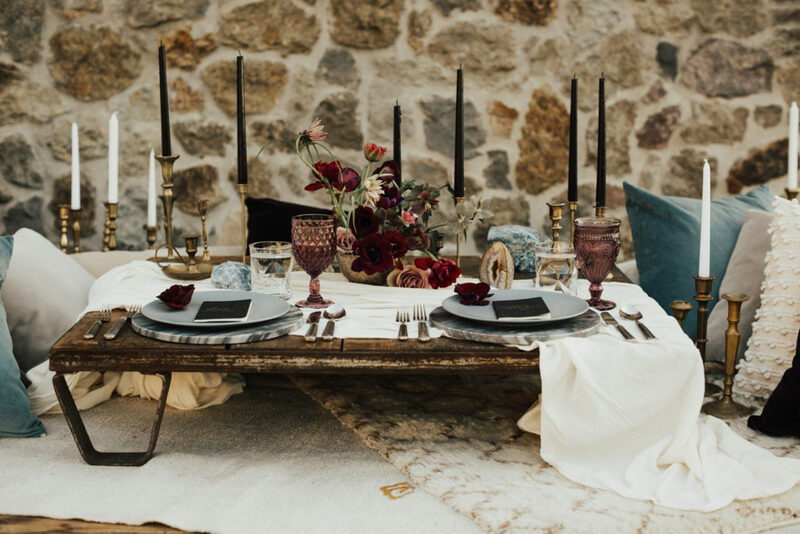 Sweet Salvage Designs contributed the furniture and accent decor, creating a moody and still inviting environment, while La Tavola‘s velvet runner in Lilac dressed the table. 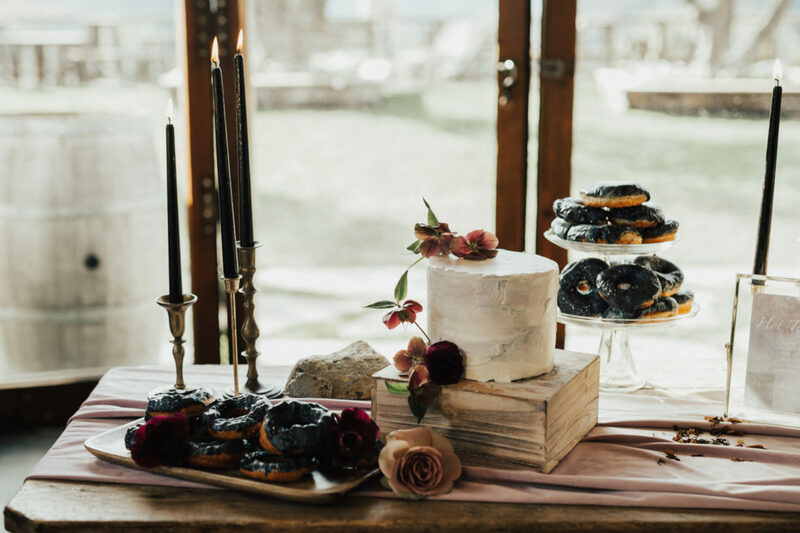 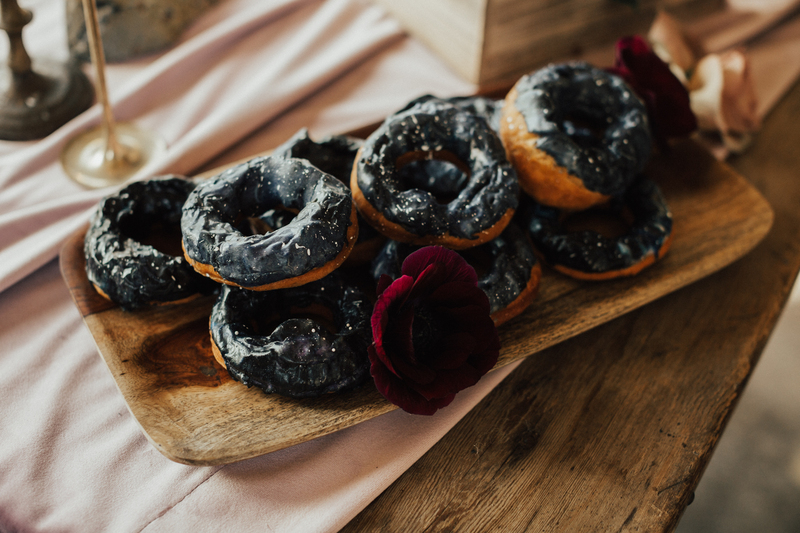 Sugar Lab Bake Shop provided a minimally elegant white, single tier cake, and galaxy inspired, deeply hued donuts for the couple to enjoy with their hot toddies. 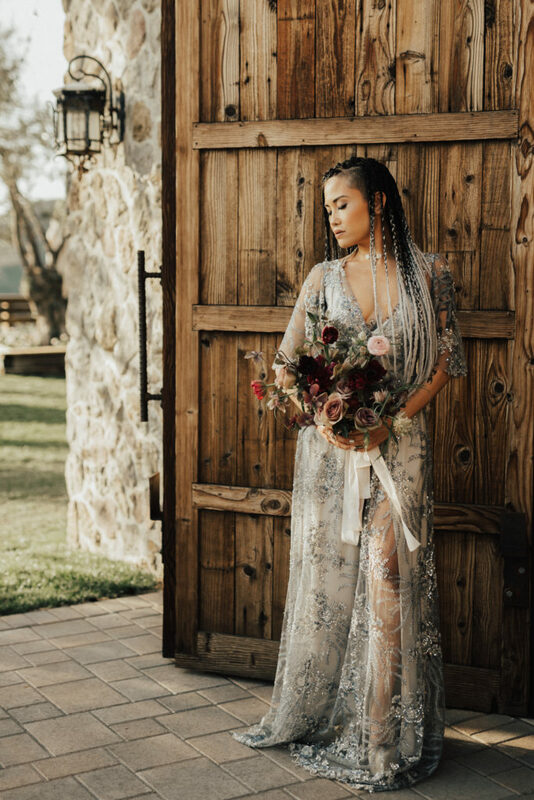 Keeping in line with the overarching theme, our stunning model “wife” wore an ethereal, silver-blue, beaded Gossamer gown. 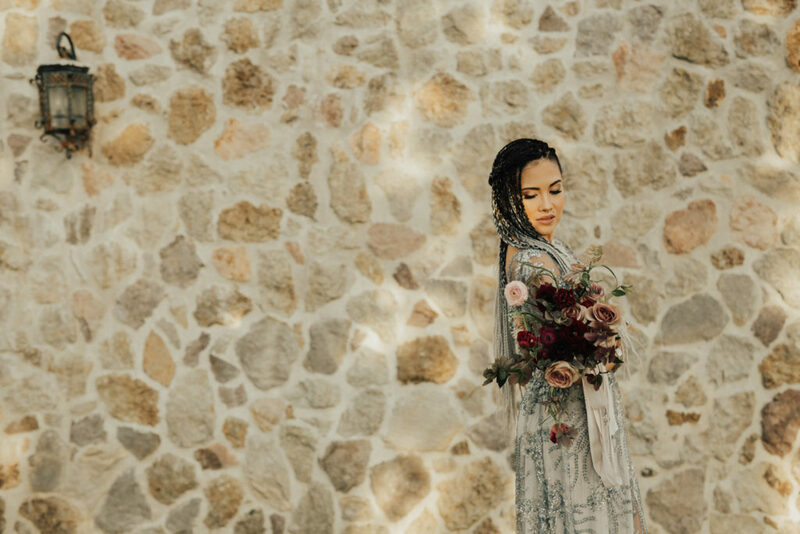 Cheek to Cheek Artistry beautified our model with subtle “bridal” style makeup, and styled her beautiful silver tinged, braided hair. 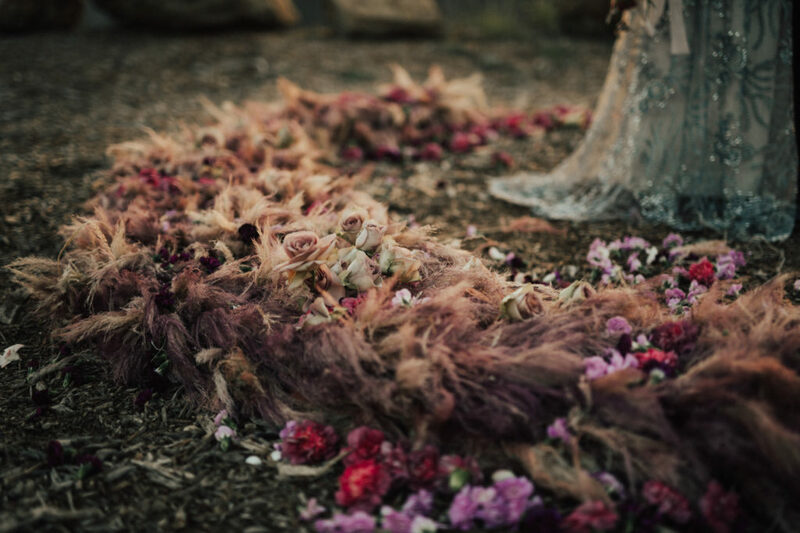 We loved that the models dress and hair were both a bit non-traditional, as it coincided with the concept of the shoot. 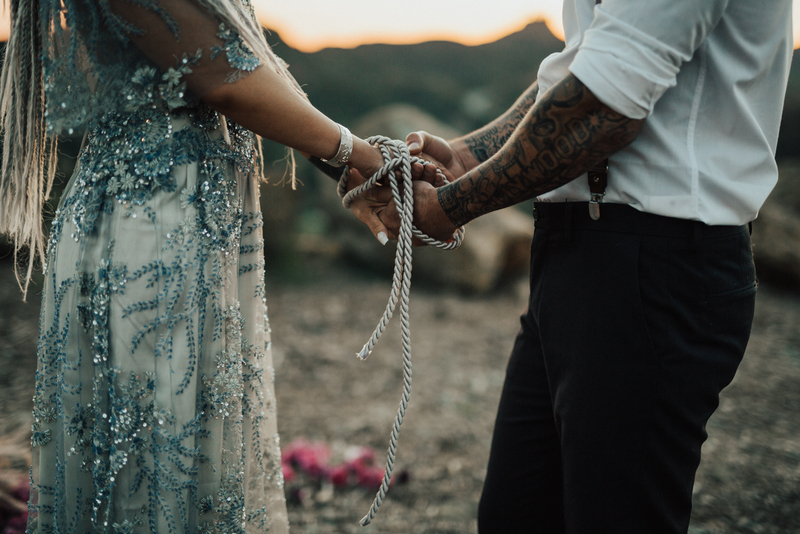 During the ceremony, the couple included a hand fasting ceremony, binding their hands together with a silver cord, to symbolize their connection and devotion to one another. 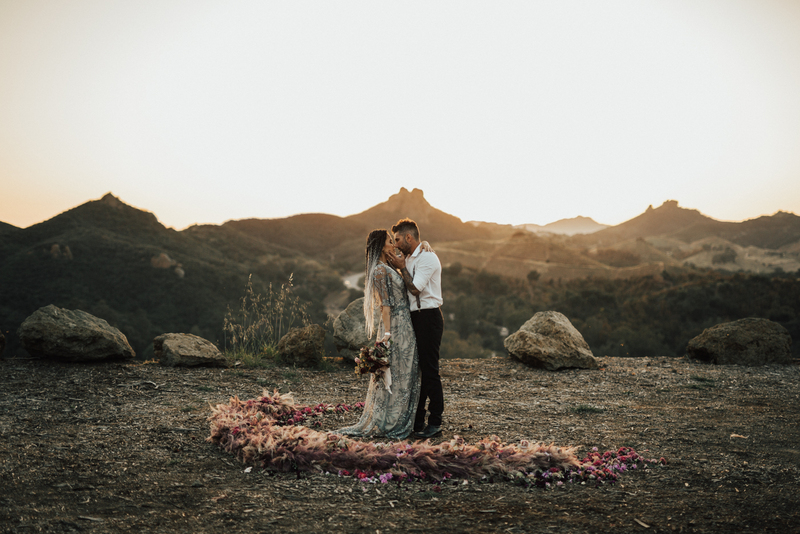 The couple finalized the day by burning a beautiful smudge stick, made of California white sage, foraged roses and lavender. 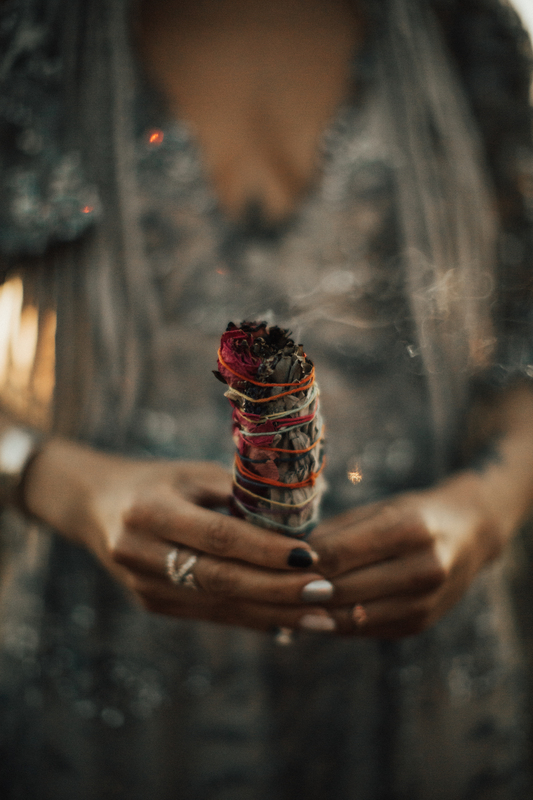 Smudge sticks are believed to help to “reset” yourself or your space and clear out any negative energy.